This is an archived page from the 2015 York Rally website. Please use the website menus to find current pages! Our thanks to Sustrans for their assistance in organising many of the family-friendly rides from the York Rally. NOTE: This is an achived page from the 2015 York Rally. For the 2016 Rally rides page, please use the menus above or left. This page lists rides running from the Rally, ranging from family friendly pootles to evening pub rides to all-day adventures into the Yorkshire Moors and Dales. 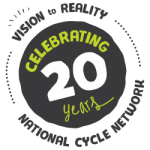 2015 is a really important year for Sustrans – it marks the 20th anniversary of the National Cycle Network. Click to read more about all the people who helped them develop it, to the thousands of volunteers who work to maintain it, and the millions of people who enjoy it every day. Unless otherwise mentioned, there is no need to register in advance on any of these led rides, and participation is free. Just turn up on the day! Departure locations will be clearly marked on site, in the show programme and here online nearer the time. Bike Week is an annual opportunity to promote cycling, and show how cycling can easily be part of everyday life by encouraging ‘everyday cycling for everyone’. 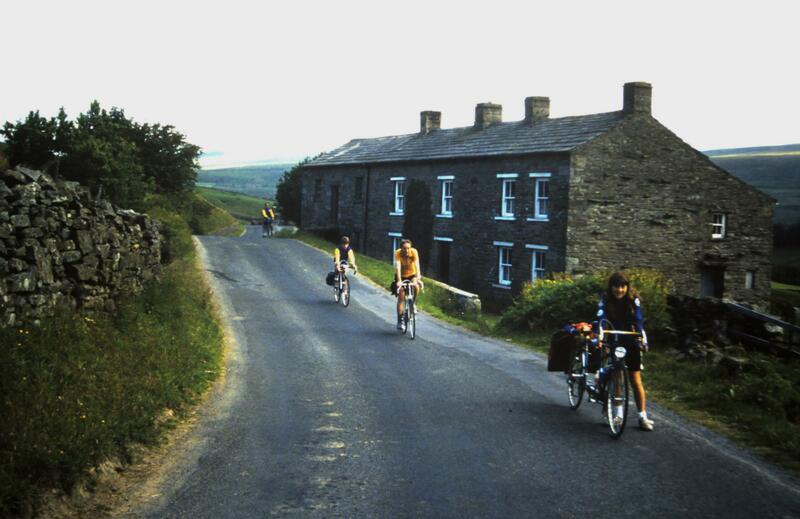 Demonstrating the social, health and environmental benefits of cycling, the week aims to get people to give cycling a go all over the UK, whether this be for fun, as a means of getting around to work or school, the local shops or just to visit friends. The 2015 event will take place 13-21st June but events still take place through until September and beyond! All Sustrans rides listed are led by a trained ride leader. Each of these rides is limited to 15 – first come first served – although more can be accommodated if volunteer marshalls can be found to assist. All children must be accompanied by a responsible adult. Riders will be issued with a map of the route and will have the option of spending more time at any of the attractions visited. 7.20 PM: Sustrans evening pub ride to Riccall. Leader Peter Huxford, a local volunteer Sustrans Ranger, says “The route is all off-road and there are friendly pubs with a village green. It’s about 8 miles each way. Lights needed!” Route here. 7:40 PM: Evening pub ride to the Carlton Tavern, Holgate, York. Short ride to this nearby (less than two miles away) pub, which has apparently offered to provide free food if more than 10 people come! As with all evening rides, you MUST be equipped with working lights. Leader is Darren Sables. Route online here. Thanks to Audax UK for organising the 100k ride on the Saturday! 8:30 AM: ‘A’ Ride to Malton An all day ride to Castle Howard (elevenses), Malton (lunch stop) and Stockton-on-the-Forest (tea stop), about 50 miles, led by Graham Lawrance. View the route on Mapometer. 8:40 AM: ‘B’ Ride to Shiptonthorpe. The ride to Shiptonthorpe will be 56 miles via lanes to Stamford Bridge, Pocklington and Shiptonthorpe with a cafe stop at Langlands Garden Centre. Return route via Seaton Ross, Laytham, Bubwith, North Duffield then track across Skipwith Common to join the Sustrans Selby to York route at Riccall into York. Led by Sally Raines. To view the route online via Mapometer, click here. 8.45 AM: Tandem ride into the Yorkshire Wolds. Pub lunch at Huggate. Route includes TransPennine Rt65 rail track, Wheldrake, Nunburnholme, Cold Wold, Huggate Wolds Inn for lunch. Millington Pastures, Sustrans Rt 66 to York. 54 miles. Run leaders Dave & Lydia Falkingham. View the route on Mapometer. 9:00 AM: ‘C’ Ride to Knaresborough Morning ride to Knaresborough (for elevenses) taking in several sections of off-road riding en-route, 44 miles, led by Gary Knighton. Route viewable online via Mapometer here. Due to the nature of the barriers en-route with no easy work around tricycle users may find this route a challenge. 9:00 AM: 100k Audax. Details are here. Route online here. 9:20 AM: ‘E’ Ride to Riccall. To Riccall (for elevenses) out via quiet roads, return via the’ solar system’ cycle track, about 20 miles, led by Steve Hedges. Route online here. 9:30 AM: Sustrans Tour of York. A short, easy ride for families – this is a York city centre ride with with local volunteer Ranger and Blue-Badge guide Roger Armistead with a walking tour of major tourist sites. Route map here. 10 AM: Sustrans super easy family ride to Naburn This will be guided along the Solar System Greenway as far as Naburn Station but the more energetic can go on alone the full distance to Pluto near Riccall. Explanatory talk from a member of the York University Astropark. All traffic free. Route map here. 11:30 AM: Sustrans slightly longer ride This will be on the ‘Way of the Roses’ going to the National Trust’s Beningborough Hall, 9 miles each way – largely off road but with a couple of miles on road. The start is timed to be there for lunch. Route map here. 1:30 PM: RSF ride to Dunnington (and maybe beyond! ): about 20 mainly flat-ish miles using a mixture of cycle tracks, bridleways and quiet lanes. We will have to cross some main roads. Refreshment stop en-route. Route online here. 6:00 PM: Bike Week easy pub ride (under five miles each way, almost entirely traffic free) to the Blacksmith Arms, Naburn. Details are here. You will need lights! The nationwide club for riders who enjoy a mix of on and off road cycling! Sunday, leaving 8:45 AM: An all age worship service with a Father’s Day theme will take place at St Matthew’s, Naburn, at 9:30 AM. A ride to the church will leave the Knavesmire at 8:45. There will be a marshalled ride back after the service. Route here. 10 AM: RSF ride: the Solar System from the Sun to Pluto – and back – all in an morning! A gentle easy going ride along York’s famous Solar Cycle Path mainly on cycle tracks and a few quiet lanes. Meet at 10am – back for lunch! About 8 miles each way. Refreshment stop en-route. Route online here. 11.15 AM : Sustrans Sports Village/Velodrome ride: This will be out to the Sports Village including a chance to ride on the velodrome (there will be £5 fee for this, for an hour’s session following the hour already booked by the British Human Power Club. Pay ride participant Darren Sables in cash at the velodrome if you want to do this), and back along the Foss Island Greenway via St Nicholas Fields Environmental Resource Centre. Route map here. Approx 11:30 AM: Café Cycling Ride to Naburn (kindly hosted by York Bike Belles). Start at York Minster main entrance, 11AM and will take about 2 hours. They say: “Join us on a short ride out of York to Naburn led by Claire Drury. Delightful ride mainly along flat traffic-free routes and greenways. We’ll stop at the York Rally on the Knavesmire to see if anyone wants to join us and then cycle to one of the cafes in Naburn.” More info at www.facebook.com/yorkbikebelles or www.itravelyork.info. Route here. We apologise but the Tweed Ride we had hoped to run at this year’s Rally will not be going ahead as a York Rally ride. 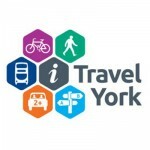 Many thanks to the iTravelYork team at City of York Council for their assistance! Self-guided rides are also very popular at the Rally – just head out with your friends! If you’re short of ideas iTravel York have 8 free route sheets to download… and the York CTC have a helpful list of cyclist-friendly cafes. York to Naburn is just five flat miles each way, almost entirely on an old railway line and going past the scale model solar system. You can join it between Points 3 and 4 on the free PDF map direct from the Rally site. Several of the short rides listed above will also use some or all of this route. York to Beningbrough Hall is a little longer at nine miles each way, but again it’s largely off road and flat. Start point on the map is York train station, just a few minutes’ ride from the Rally via Sustrans Route 65. Anybody wishing to check out the latest ride information is very welcome to follow the latest updates at @YorkRallyRides on Twitter. Please do not be offended if we don’t follow you back – this account will only be following a few relevant people and organisations who are involved with day/touring rides, to reduce the ‘noise’ usually associated with Twitter. This page will also be updated regularly with the latest details. Finally, anybody wishing to lead or assist with rides (backmarkers and group leaders for rides with larger numbers) is invited to express an interest by emailing the Rides Co-ordinator on: rides@yorkrally.org. On a Saturday ride in the late ’80s. Photo courtesy of Charlotte Gray. The A B C rides are possible for road rides without suffering damage and riders have ridden road bikes on these rides in the past. However, these rides are more suitable for touring bikes where the wheels are stronger and tyres generally at 28mm wide. If there are any concerns, it would be worth checking out the route before riding with the ride leader or someone with local knowledge. These rides will utilise a small amount of off-road riding which could range from tarmac and smooth cinders (as normally found on the National Cycle Network) to rutted and pot-holed farm tracks. Gary – Day Ride Co-ordinator. Do you have a day/time for the tweed ride yet please? It difficult to give a day/time for the Tweed Ride as the organisers has not got back to me with a satisfactory proposal for this ride that includes the distance with destination and/or route, and other information that we need. 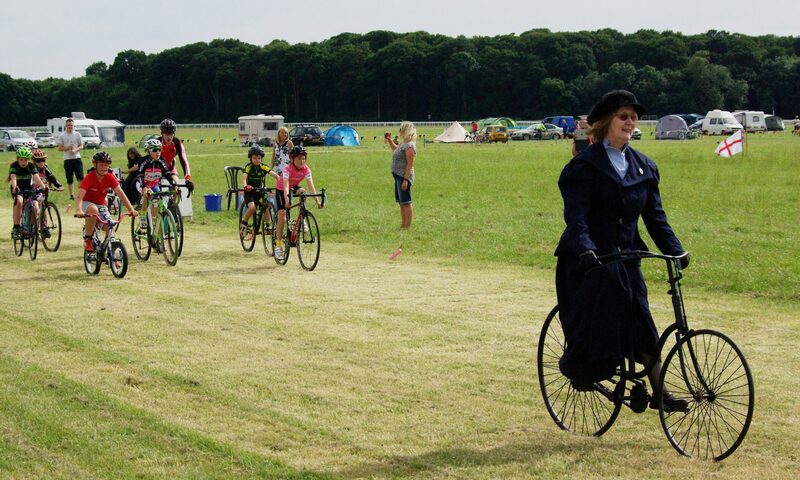 Due to circumstances behind the control of the York Rally, any Tweed Ride from the Knavesmire this year will be treated as a private expedition and not as ride organised by or for the York Rally and therefore York Rally cannot be held responsible for any event resulting from any action of the Tweed Ride.